What is the process for applying to AIS-R? To learn about the process for applying to AIS-R, please visit the Admissions webpage. What are AIS-R’s fees and tuition rates? To learn more about AIS-R’s tuition and fees, please visit the Tuition and Fees webpage. What is government VAT and how does it affect my school payments? As of January 1, 2018, the Kingdom of Saudi Arabia implemented a Value Added Tax (VAT) rate of 5% to all tuitions and educational supplements. This is not an added AIS-R cost but rather a government mandated tax. Saudi Nationals who provide their family national number are exempt from paying VAT. Does AIS-R offer a sibling discount? AIS-R tuition costs are determined per child and division and not per family. Thus, in an effort to keep tuition as low as possible, AIS-R does not offer sibling discounts. If it did, this loss in revenue would need to be made up by increasing regular tuition for all students. If an applicant has dual citizenship, which passport must be used during AIS-R's application process? Any applicant holding a Saudi passport must apply using their Saudi passport. Applicants from other nations should use the passport connected to their Saudi visa (e.g., Iqama). What if I attended AIS-R previously and I am reapplying now? Students who wish to return to AIS-R are invited to undergo a re-admissions process but should note that all new student fees apply, with the exception of a possible reduction of the Registration and Capital Fee, depending on how long the student has been away from AIS-R. For further details, please visit the Tuition and Fees webpage. What type of curriculum does AIS-R offer? As a school committed to excellence, our curriculum is based upon US national standards including the Common Core for English Language Arts and Mathematics, Next Generation Science Standards for Science, National Core Arts Standards for Fine and Performing Arts, C3 for Social Studies and AERO Common Core+ for our other specialists courses. As an IB World School we offer the International Baccalaureate (IB) Diploma Programme for our 11th and 12th grade HS students. Please visit the AIS-R K-12 Curriculum webpage for more detailed information for each subject and grade level. Does AIS-R offer extra-curricular activities? AIS-R students have the opportunity to be involved in a wide variety of activities through the After School Activities (ASA) program. Students may enroll in activities in a variety of subjects throughout the year such as athletics, computers, music, fine and performing arts, etc. In addition, there are a wide variety of clubs that offer service opportunities and develop leadership skills including Student Council, Model United Nations, TED, and Eagle Ambassadors to name a few. AIS-R also boasts a fine and performing arts program that includes student written and directed performances as well as opportunities to engage in a variety of performances. Finally, AIS-R has an extensive athletics program, participating in a variety of tournaments both inside and outside the Kingdom, giving students a myriad of opportunities to travel and play sports. What are the approximate class sizes at AIS-R? 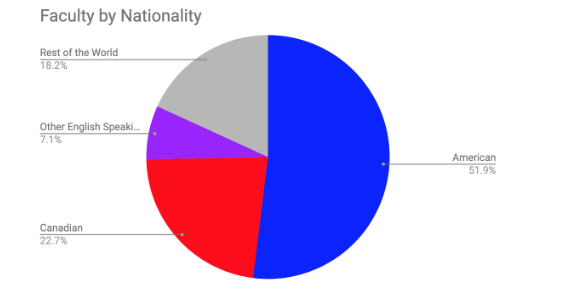 What are the nationalities of AIS-R students? AIS-R students come from more than 60 countries. The top nationalities are American, Saudi Arabian, and Canadian as indicated in the figure below. What are the nationalities of AIS-R teachers? 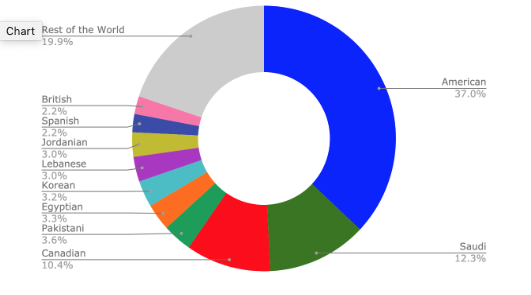 For the most part, AIS-R teachers are from the United States, Canada, and other native English speaking countries as indicated in the figure below. AIS-R is located next to Al Bustan Village Compound, in North Riyadh Exit 5. Does AIS-R provide school bus transportation? AIS-R does not offer bus transportation. Parents are responsible for providing transportation for their children. To ensure student safety, compound buses and private vehicles are only permitted to enter the campus parking area upon presentation of a valid AIS-R ID card. What are AIS-R's school hours? Administrative offices are open from 8:10 AM to 4:30 PM Sunday through Wednesday, and 8:10AM to 4:00 PM on Thursdays. Weekends are Fridays and Saturdays and summer hours are limited. What is the start date and end date at AIS-R? The first day of classes for the 2019-2020 school year is Monday, August 19, 2019. The AIS-R calendar consists of a similar number of instructional days as private U.S. schools and other American International Schools worldwide. It accommodates the required local holidays in addition to some of the major U.S. holidays. The last day of school for the 2019-2020 school year is scheduled for Wednesday, May 20, 2020. Do AIS-R students wear school uniforms? AIS-R does not require students to wear school uniforms but does have a student “dress code.” AIS-R believes that students need to feel comfortable and confident at school in order to do their best. Accordingly, students should dress with modesty and decorum in order to avoid making other students feel uncomfortable, and in keeping with the traditions and customs of our host country. Please see the Student-Parent Handbooks below for specific guidelines regarding dress code and required Wellness, Health and Fitness Uniforms (PE clothes) for KG2 to Grade 12. If I would like to learn more about the division my child will be in, where should I look? Does AIS-R provide a lunch program? All students in KG2 to Grade 5 eat lunch in the Elementary Dining Hall, where they are supervised by teachers and support staff. While all KG2 students bring their own lunch to school each day, students in Grades 1 to 5 can either bring their own lunch or purchase a healthy hot lunch and drink from the Elementary Dining Hall. Students are welcome to purchase their lunch in the Middle/High School Dining Hall. A diverse and healthy menu is available that includes a hot lunch, a selection of western and international foods, a salad bar, and a variety of beverages as well. Students who do not wish to purchase their food at school are welcome to bring their own snacks and lunches from home. What are the technology device requirements for students? Families are required to have internet access at home so that students may access learning resources outside of regular school hours and during scheduled Virtual Learning days. All students beginning in Grade 3 are required to participate in AIS-R’s BYOD 1:World program. An important component of AIS-R’s learning program is the blended learning platforms. AIS-R utilizes several blended learning platforms to extend learning beyond the classroom. The main communication and collaboration platforms are Blogs/SeeSaw/Google (ES) and Moodle/Google (MS/HS). Student access to these services at home is essential for students to continue to work on assignments, to collaborate with peers and teachers, and learn what they missed in classes after absences. Parents can also access Blogs-SeeSaw and Moodle to stay informed about all the great learning that is happening in their children’s classes. What world languages are offered at AIS-R? Students in KG2 to Grade 5 take Arabic language classes 3 times every six days. Grades 6 through 8, all students take Arabic culture and language, and may register to take French as an additional language (pending approval of the schedule). Students in Grades 9 and 10 may choose from Arabic or French. Students in Grades 11 and 12 may choose from Arabic, French, Arabic ab initio, French ab initio, or Spanish ab initio. In addition, the Ministry of Education mandates that all Saudi National Students take Islamic studies once per week. Does AIS-R administer standardized tests? AIS-R administers the NWEA MAP (Measures of Academic Progress) test to measure growth and to inform classroom instruction. Students from Grades 1 to 9 take the MAP test in the fall and spring, and a few grade levels also test in the Winter. The College Board PSAT, SAT, and IB DP Diploma Programme exams are also administered in the high school. Where do AIS-R graduates go to college/university upon graduation? AIS-R students matriculate to some of the finest colleges and universities in the world. 65% of AIS-R graduates attend university in the United States, 15% attend in Canada, 10% in the United Kingdom, 5% in the Middle East, and 5% throughout the rest of the world.